I was naked & sweating in the sauna at World Gym (same one in which I wrote "Sauna Poem" & "Poetry Inferno"). my fingers slid across hot wood & felt something. no. it's not that kind of story. what I felt turnd out to be a penny. suddenly that hot copper was a madeleine as I became flush with memories of all the pieces I've done featuring this lowliest of coins. 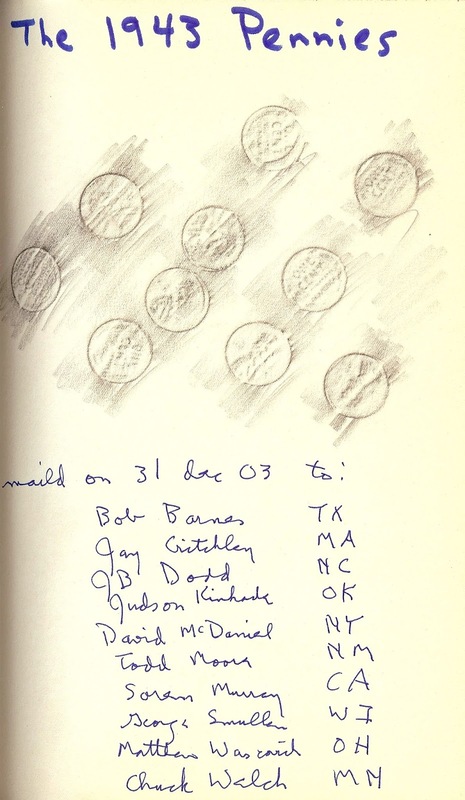 I began "Pennies from Heaven" at the end of 2000 & finishd it in summer of 2011. there were 120 coins in that piece. it's "sequel" was "Pennies from Heaven: Part 2 (The Leaving)." it was done from 2010 until 2014. 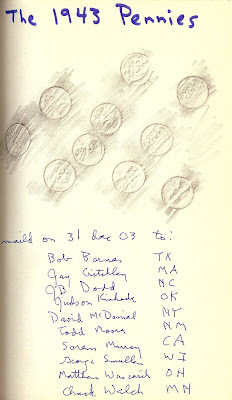 "The 1943 Pennies" was a little work from 2003-04.
more recently I collaboratd with Tyler Alpern on a penny piece a bit too naughty to share here. finding this morning's penny also made me remember I had a baggie full of coins I'd found & labeld. I decided it was time to conceive a work which wd distribute those. 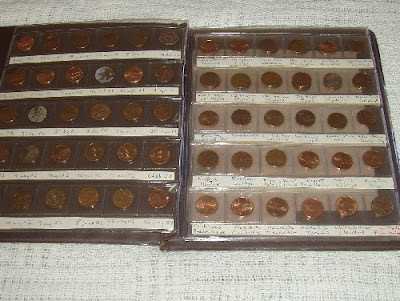 my initial notion was to list the origin of those pennies. then to mail each to someone whose name supplements the list. but that seemd merely a variant of "Matchless." so I go to bed knowing I need to stretch. 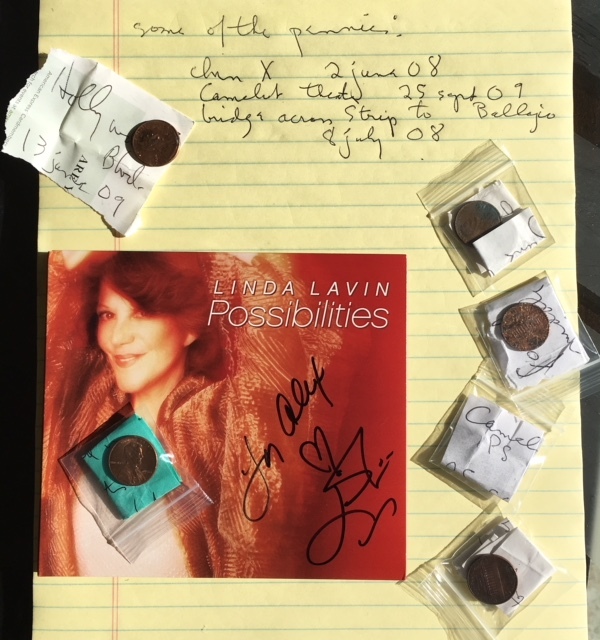 & also that this morning's coin -- which I now call "the sauna penny" -- shd not be used in the new project but kept as a talesmanic muse with a possible future as yet another work. over the weekend I put on for the first time the CD I bought a few weeks ago from Linda Lavin. I opend the baggie of saved pennies. one by one I took out a coin & "unwrapped" it. 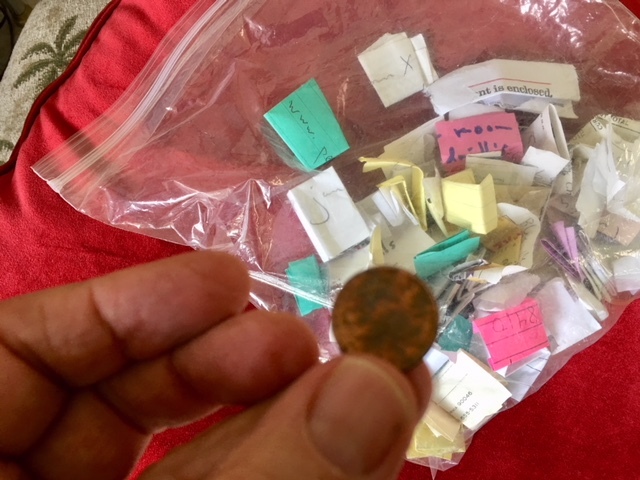 I then put each penny with its original notation into a tiny baggie. this process turnd out to be a major memory trip. the collection mostly reflectd my day-to-day life in Santa Fe. pennies pickd up in various locker rooms & store parking lots. but there were also many found at airports which in turn included ones from vacations. gay resorts such as Inn Exile in Palm Springs & Blue Moon in Las Vegas & Coral Sands in Hollywood & Alcazar in Fort Lauderdale were spots holding pennies for me to gather. because the work was surprising tedious I did it over several days. I now have that original baggie full of 68 tiny baggies. what to do next will take time to ponder. I have some ideas but will wait for the new year to complete this.